When I thought of Corsica, my mind was filled with mixed feelings. My actual first time happened more than 10 years ago when we arrived with the first ferry from Nice and left with the last ferry to Genova. It wasn’t something to remember and neither was the infrastructure and tourism back then. 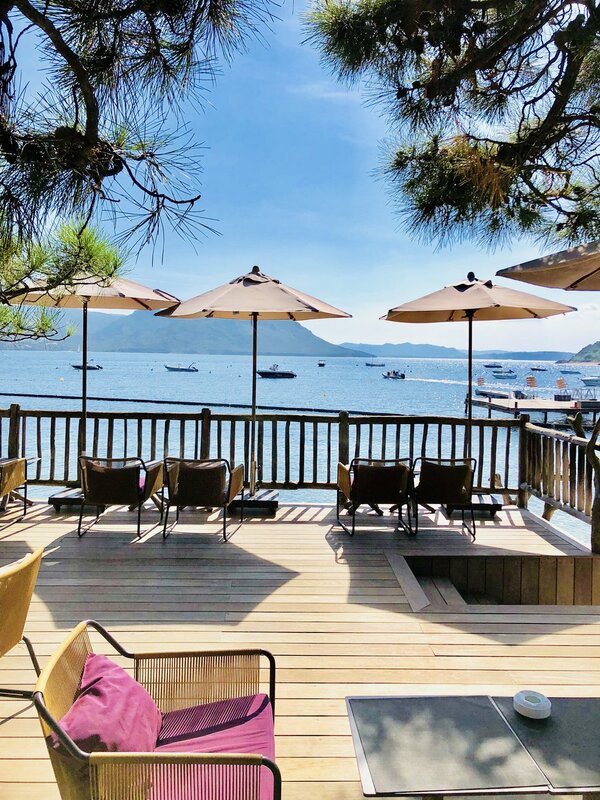 However, times have changed and with the emerge of Social Media, the power of modern marketing and the influence of luxury hotels to a destination Corsica finally made it on the luxury radar. 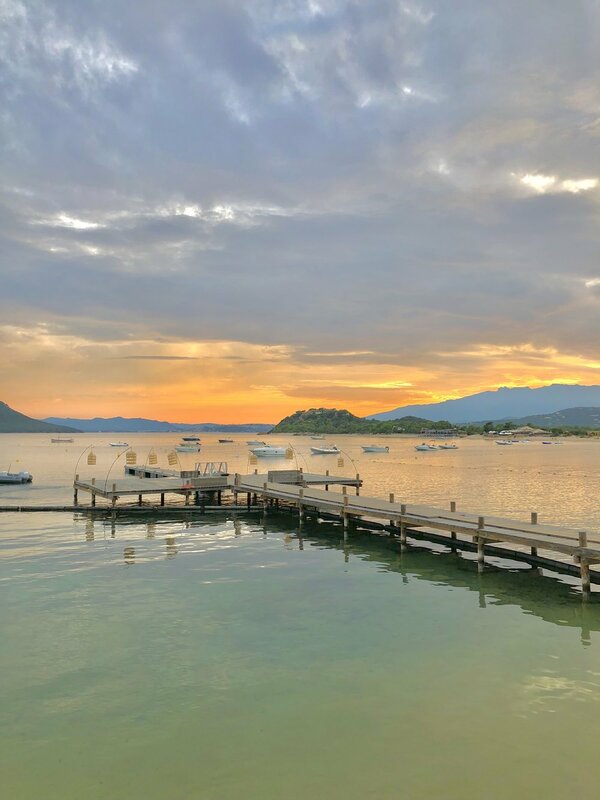 Especially the posh town of Porto Vecchio has experienced an amazing boost the last few years and is now the heart of the luxury hospitality on the island. With two Relais & Chateaux properties, the spot had to be on our list as well and I was totally up to finally stay there to see whether the places comes up to the hype. Due to the fact that I only had two nights, I wanted to have a hotel with a beach club or something unique. The other two luxury hotels not having direct beach access, I clearly decided for Grand Hotel de Cala Rossa. To make sure, in terms of prices Corsica is not the “secret and hidden” hotspot it used to be and you easily end up paying rates of around 700 euros to the 1.000-euro mark. Interestingly, with these sky-high prices I was surprised to only find French speaking guests at the hotels rather than an international crowd. So the island still has some kind of secret and hidden vibe which makes the whole trip a great adventure. 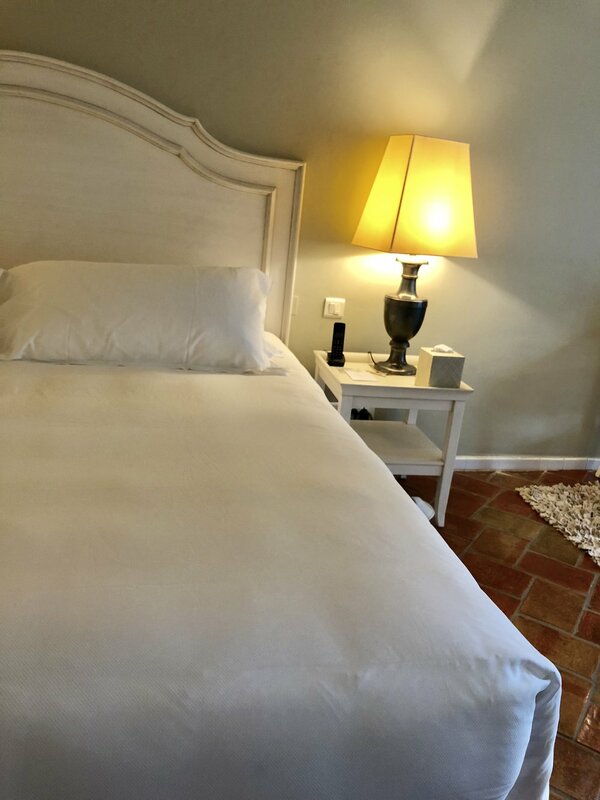 Let’s continue the story of my stay at the Grand Hotel de Cala Rossa, a hotel where I really had mixed expectations concerning the (highest) room rates on the entire island. I came directly from Bonifacio which was like a short drive and therefore arrived around 1pm. Of course it was still high season for the hotel and I was unable to head to the room directly as the property was running full occupancy and therefore needed one more hour to clean the room. Being travelling in summer season in Europe, I was well aware of this and didn’t mind further when they offered me a day-use single room to take a shower, change or get some nap. The bellmen kindly brought all my luggage to that changing room and picked them up after I left. 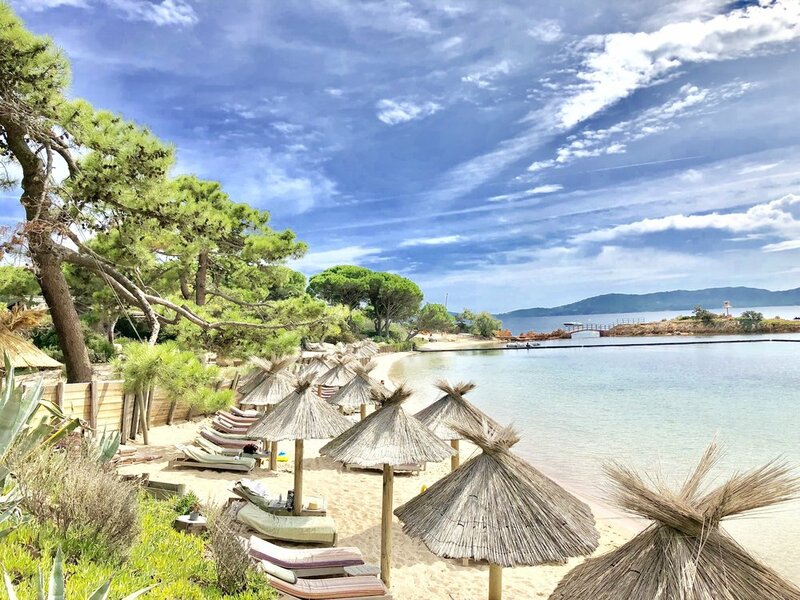 1.20 pm in Porto Vecchio, blue sky without any clouds, 31 degrees Celsius and a slight breeze: My first destination – how else could it be – was the beach club of the hotel. 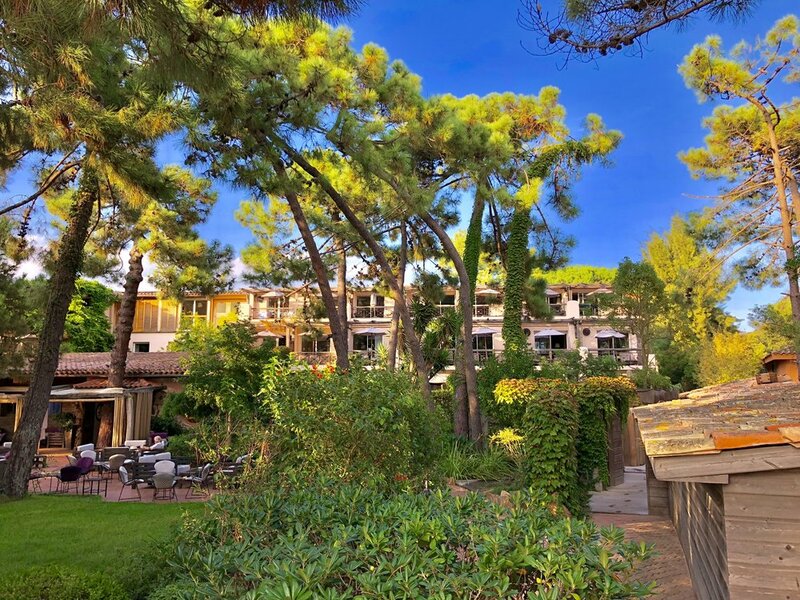 I have to admit, Grand Hotel de Cala Rossa is perfectly situated directly on the beach front In a small garden with pine trees creating a cosy and intimate feeling when looking onto the sea from the hotel rooms. So it didn’t take a minute from the front desk until I was approaching the beach boys and asked them for a lounge chair to start enjoying this out-of-the world location. It’s been some time when I last saw such a water quality and experienced such a great hotel beach club (all included in the rate of course). With the kind towel setup of the beach chairs came a bottle of water to refresh – a lovely touch. A bit earlier I was writing about a similar property a bit up the coast on Corsica where they didn’t provide that service and their biggest downside was the lack of a beach restaurant. Here, at Cala Rossa I felt like there was nothing going wrong in the first moments of my stay. When I kind of felt hungry, the staff member of the beach club approached me and informed me that the beach restaurant would close soon so this would be the last chance for a light lunch. At first I was hesitating, since I thought they also kind of have the same concept as the other hotel in Porticcio (overpriced set gourmet lunch menu) but then something in me said I should give it a try. When I was heading towards the restaurant I was welcomed in a very friendly way and offered a table in the second row. To be honest, I was impressed. Not just of the friendly service, also because of this stunning location with that over-the-top view and matching furniture. 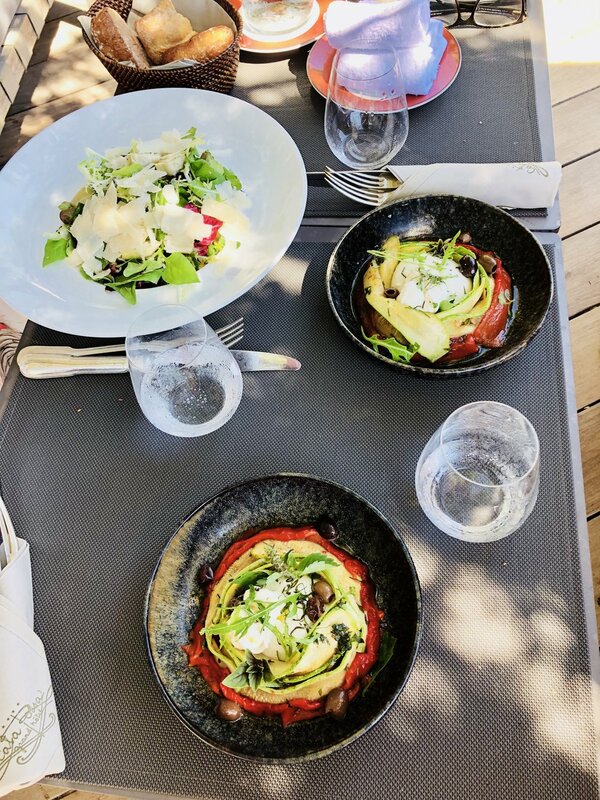 Obviously the menu was nothing else than perfect: burrata with sun dried tomatoes or Spaghetti with courgette – it was exactaly how a beach restaurant should be. Along the fresh quality and fair prices (food in Corsica is generally more expensive than on mainland France) came a flawless Michelin-starred service. That’s what I expect of a five-star beachside property. No need to mention that the staff at the beach were attentive enough not to touch your beach chair and remove your towels. After lunch I thought why not checking at the front desk and asking for my room. Luckily it was ready and I was shown to my Grand Comfort room on the first floor. I was speechless how lovely the renovation was done. 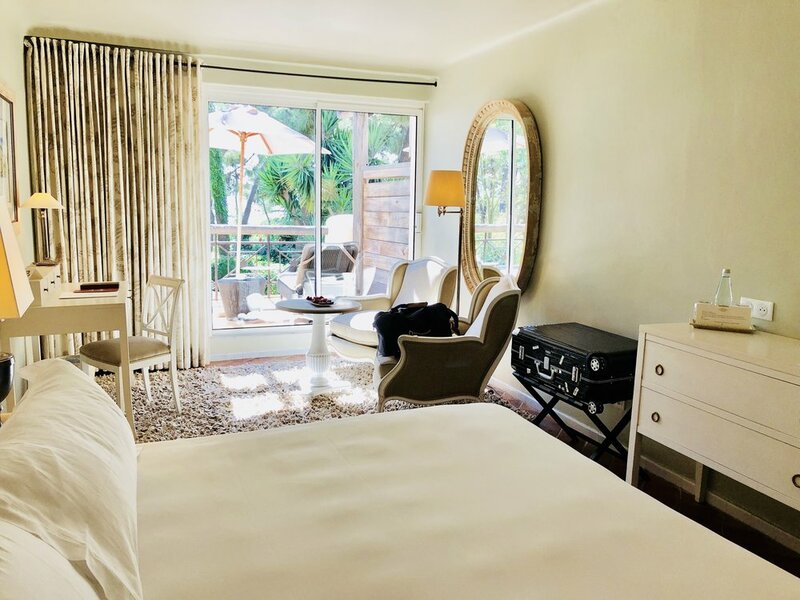 While the majority of the furniture hasn’t changed, they did slight amendments such as adding a perfectly matching carpet, stylish outdoor furniture and one the most heavenly beds I have experienced this year. When the lovely front desk attendant opened the room door I was impressed by the spacious layout of the room. It kind of felt more like a Junior Suite with a separate toilet next to the entrée, a bathroom with double sinks, shower-tub combo that was actually not annoying for the first time (thanks to the big tub and good pressure of the shower head) as well as a spacious living- & bedroom and terrace overlooking the bay of Porto Vecchio. 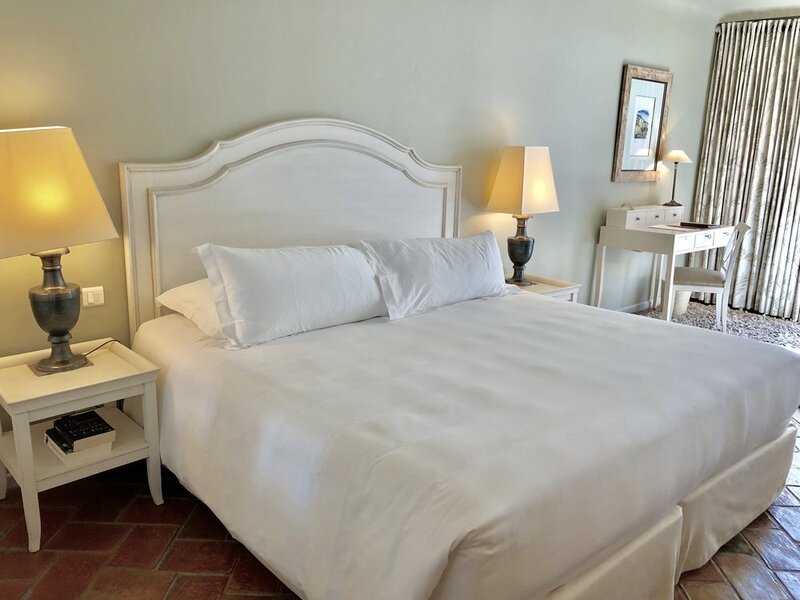 The main area of the room was made up of two spacious wardrobes, a wonderful double bed with two perfect pillows per person, a sideboard with television, two armchairs with reading light and a writing desk with chair as well as two sun beds on the terrace. While I am not a fan of hotel-branded toiletries, their Nucca toiletries were beyond amazing and if they wouldn’t have come in 200ml containers, they would now upgrade my bathroom at home. A great welcome was offered with a welcome note along freshly baked pastries by their in-house patissier. Even though the room was not the Bulgari Hotel in terms of interior goals, it honestly was a 10/10 in terms of comfort – I can’t tell why but I totally loved the vibes and match. 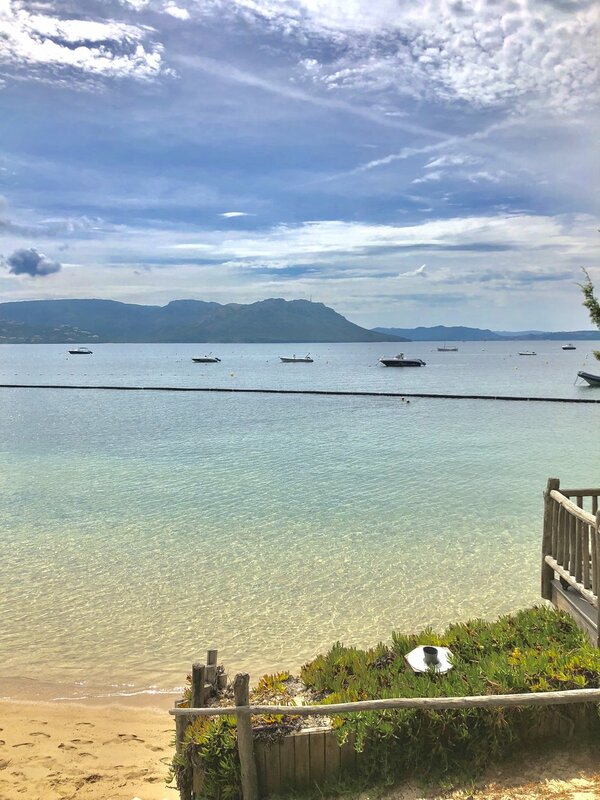 With one of the most amazing beach clubs on the island, I didn’t dare to check out their Nucca Spa, which is supposed to be one of the best in South of France & Corsica. 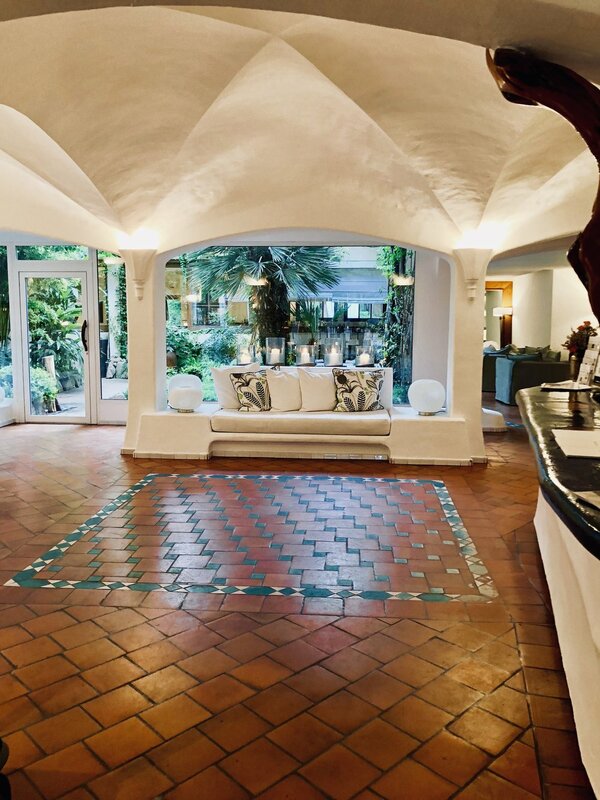 The indoor pool ensures a great stay even in low season times of October and April/May. Although the hotel has some of the best dining options I have seen with one of the island’s best restaurants, rated with one Michelin star, the beach restaurant also serving dinner with an amazing view plus another small menu at the garden restaurant – I wanted to explore the town at night and decided to try out La Table de Nathalie. Turns out that it was a great choice since the town is even prettier at night and the restaurant is a steal for the high quality and top service. To all those who plan to head to town as well, note that it is a 15-minute drive and taxis can be quite pricey, so anyhow Corsica is not the best place to leave your car at home. In any case a rental car will do so you can even take the most remote routes and go for the full experience. When I came back to my room, I was surprised to see a lovely turndown service with some sweets and bottled water. When waking up another highlight was waiting for me. No it wasn’t the sun glimpsing through the glass windows that directly overlooked the bay of Porto Vecchio and the flawless beach. I am talking about the breakfast buffet served in the main restaurant. With the highest quality of products and again a top service, the only thing they didn’t do well is Cappuccino which I guess is a general thing in Corsica. If you want to enjoy a good cup of coffee, rather go for an Espresso. Other than that I cannot praise enough: fresh and actually very tasty salmon, small portions of scrambled eggs ready to take away on the buffet so it looks tastier, the best little baguettes I had on Corsica as well as tasty homemade jams and chocolate spreads plus freshly squeezed orange juice. I also fell in love with their bottled juices and their excellent choice of cold cuts and cheese. This day was dedicated to beach and relaxation entirely and I didn’t miss out lunch this time again. Their burrata was really above par and especially for not being in Italy they are doing an amazing job. Even though chances are high that your daily expenses are nearly a third of the room rate (the one of a Grand Comfort room which sells at 1.000 euro a night), this place is made in heaven and I cannot find a reason why to give it a miss. For me Grand Hotel de Cala Rossa is a must stay place and I cannot wait until I come back to my favourite hotel on the island of Corsica. I would highly recommend to book a room early enough since they only have 40 rooms and their most affordable rooms are nearly booked one year in advance. While I was staying in a Grand Comfort room, they also have an entry room category which I saw online for 400 euros in the first week of September and I have to admit that for the location and value offered, it is an absolute bargain! Remember, you won’t spend any time in the room besides sleeping anyways so if you don’t mind there is no excuse to not give that amazing place a try. I was guest of Grand Hotel de Cala Rossa, however all above written expresses my own opinion and has not been influenced.